At CTbites, we love to meet with chefs and restaurant owners and hear them tell about their inspiration and taste their creative food and wine pairings. Recently, we noticed that many of our favorite and most successful places have an added story to tell…that of working alongside…or in some cases around the corner or in the next town from a loved one. Be it a sibling, a spouse, or an in law, we asked a few questions about their experiences and heard some amazing and inspiring stories about love, family, and a passionate commitment to what they do and thought these ” pairings “ were worth highlighting! Here is the first taste of a series about the personal side of CT dining! Twenty years ago, Biagio Riccio, known to all as Gino, put down roots in CT and began to grow quite the foodie family tree! I will try my best to do justice to all of the family heritages, both Italian and Greek, but as the parade of family members kept joining us on my visit to Osianna, I found myself actually drawing a large family tree in my notebook. Arriving from Italy at age 13 and delivering pizza’s for his Uncle Luigi’s pizza place in the Bronx, Gino opened Quattro Pazzi in Stamford in 1993, where it was known for its innovative approach to traditional Italian featuring fresh pastas and flavorful sauces. It was here that he met his wife, Kathy, and together they opened Quattro Pazzi in Fairfield in 1997. Kathy and her sister, Maria Giapoutzis had moved here from Greece and grew up working alongside their brother in the diner business. Once Gino and Kathy married, Gino, who always loved to cook, enjoyed learning the Greek cuisine from Kathy and Maria’s mother, Anna. “ I liked the simplicity and lightness of the food”, Gino remarked, and so with his sister in law, Maria , as owner and general manager, they opened Osianna in 2007, to offer authentic Mediterrean and Greek fare in a colorful converted house on Reef Rd. Some of the questions I asked included what are the advantages to working so closely with a family member. Both felt that the most important advantage was knowing and trusting that the business was in “good hands” at all times, that certain standards of food and service would be consistent no matter who was in charge. They all commented on how proud they are of their hardworking staff of servers and cooks. 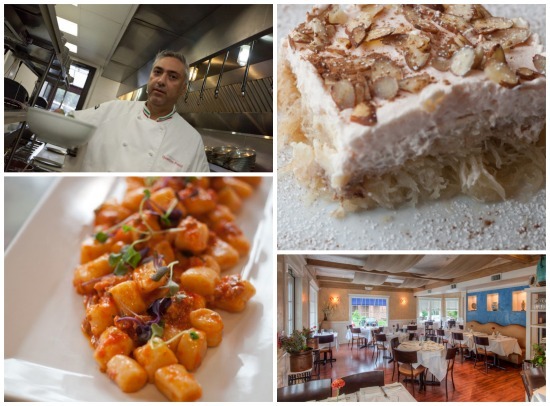 The relationship works, with Gino creating both restaurant menus, including using homemade sauces at Quattro Pazzi made each day and driven up from Yonkers by his 80 year old father, Angelo. The desserts at Osianna include homemade Greek specialties made fresh by Maria and Kathy’s mother, Anna, and include Ekmek, an amazing dessert of shredded wheat pastry in honey syrup with alternating layers of custard, almonds, fresh whipped cream and more almonds, and Karidopita, a walnut cake drizzled with syrup and served with Vanilla Bean Gelato. Truly a family affair, as even Maria’s husband, Nuncio DeTomasso, is part of this very family driven business, acting as General Manager at Quattro Pazzi and making his specialty, Tiramesu. Holidays are celebrated with both families, Italian one night, Greek the next , and even days off are spent with each other. Gino shared one story about a both families vacationing and cooking up 2 lb lobsters on the deck of their hotel!.